The latest one was entirely fortuitous as I was playing around with my new SanDisk 2GB card, FileProg (which I recently reviewed) and PowerRun when the thought suddenly hit me that I could launch .prc files directly from the card instead of installing the application using HotSync. The main issue that I was looking to resolve is that in a typical week I am evaluating at least 20 new applications and I wanted a fast way to get these on and off my Treo (keeping those that I like and discarding those that I didn't). As you know, the 'normal' process to install an application on your Treo is to download a zipped file, unzip this file on your PC, double click the .prc and .pdb (if included) to launch the Install Tool and finally to perform a HotSync. Now, in my view the above process is perfectly fine if you're installing just a couple of applications once in a while but not if like in my case you 1) have only a few megabytes left of free memory on your Treo and 2) after evaluation you'll need to remove most of the applications that you've just installed (I use Destaller Pro for this). Let's take a specific example: You're looking for the 'best' Backgammon game available for our Treo and after searching you find twelve that look interesting. You download all dozen .zip files to your PC and extract them. Now you realize that you cannot install them all at once because they would use up 7MB on your Treo but you only have 3MB of memory left... What do you do? You can go the 'normal' route and install each application one by one (or in a couple of batches), play around with it and decide if you want to keep it or remove it. Anyone who has done it this way will know what a long and tedious process it can be. If you use PowerRun you can unzip all 12 applications on your PC, create a new folder called "Backgammon Evals" (for this example) on your SD Card in the PowerRun directory (Palm > Programs > PowerRun) and copy all 12 .prc and .pdb files over to the new folder that you created. Once this is done, insert the SD card back in your Treo, launch PowerRun and select Options > Update Shortcuts. That's it, now all 12 apps are installed on your card and ready to be used without taking up a single MB of our precious Treo memory and can easily be deleted within PowerRun. The last but fastest process of all however has proved to be one using Resco Explorer. At its most basic level, Resco's Explorer performs very similar file management functions to those of FileProg but has the important added feature of a built-in Zipping tool which is essential for my needs. In this case, I created a new folder on my SD card (it doesn't matter which directory it's in) and quickly copied all the downloaded installers (no need to unzip). Once this is done you can insert the card back in your Treo, launch Resco Explorer, navigate to the folder you created and click on the .zip file to instantly open it and launch the application. Finally, the thing that I find really superb with Resco Explorer is that any application that you launch this way is only temporarily copied to the Treo's RAM but immediately deleted after you exit the application - this way I can evaluate as many new apps as I want without worrying about my available memory. In the three screenshots below you can see how I go from zipped file to .prc to launching the application on my Treo with Resco Explorer. Separately, once I've finished evaluating all applications with Resco Explorer I can quickly delete those I'm not interested in within the program and also copy those that I want to keep to PowerRun's folder (as in Option 2 above). 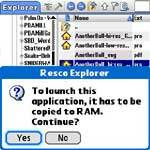 If like me you're looking for a solution that allows you to easily evaluate multiple applications, has a built-in zip tool and is also a powerful file manager then there is no doubt that you'll be hard pressed to find a better option than Resco Explorer. I've created a 10% coupon code (simply enter TNExplore in your shopping cart) valid until May 10 for both Destaller Pro and Resco Explorer in your Software Store. A PHOTO OF THE VERIZON TREO 650!!! I was wondering how different Destaller was from Uninstall Manager from Northglide. Does Destaller have a "sandbox" feature that Uninstall Manager has? Also, is there any advantages from using one over the other or using both? WOW! This is so cool! I just took the .prc for REscoExplorer and directly put it on the card. It launched, no problem! I had no idea that I could do that! And it comes as a very fortunate time. My Treo 650 is going back due to non-communication issues. So this is the only way I can install right now! Meloveu, I obviously need to take Uninstall Manager for another spin as it appears that I may have missed something - thanks.